Why are some organizations able to innovate time and again, while others hardly innovate at all? Our research suggests that leadership is a critical piece of the puzzle. That leadership matters to innovation should come as no surprise. But what many people consider “great leadership” does not work when it comes to building an organization that can innovate routinely. Leading innovation is not about getting people to follow you to the future; it is about getting people to co-create it with you. While many have studied leadership and innovation, surprisingly few have explored the connection between the two. 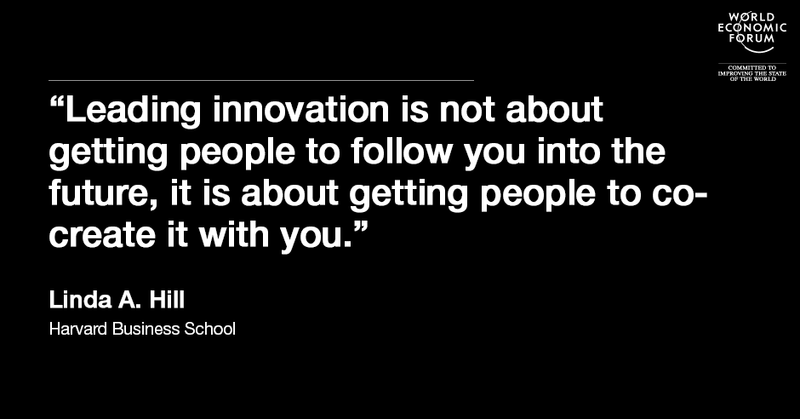 My collaborators and I spent over a decade studying exceptional leaders of innovation. We logged countless hours observing these individuals in action across the globe – from Silicon Valley, Europe and the United Arab Emirates to India, Africa and Korea – on our quest to understand who these leaders were and what they did. Some leaders worked in organizations widely considered hotbeds of innovation; others ran parts of firms rarely associated with the cutting edge. Some led start-ups; some led well-established companies trying to figure out how to sustain success, while others took over organizations that had lost their way and desperately needed rejuvenation. And some worked in government agencies, social enterprises or cross-sector networks. Their innovations ran the gamut from new products and services to business processes, organizational structures and business models. Although there were differences in how they did their work – which reflected cultural and personal style differences – there were striking similarities in what they did and why. The leaders we studied were far from perfect, but they demonstrated mastery of an art that we need desperately. While all were visionaries capable of creating a vision and inspiring others to pursue it, none considered this their primary role. Instead, they saw themselves as “social architects”, whose role was to shape the context. They created communities in which others were willing and able to innovate. This task may sound straightforward, but innovation is tremendously taxing work, and not just for leaders. Innovation is a journey, a collaborative problem-solving process, where discoveries happen through a process of trial and error, false starts, and even mistakes. The process can be exhilarating. But as many of us know all too well, it can also be downright scary. Look beneath the surface of almost anything that is new and useful, and you’ll likely see that it came from multiple hands, not the genius of some solitary inventor. Innovation is a “team sport”, in which individual effort becomes something more. These leaders believed that seemingly ordinary people have the potential to make extraordinary contributions to innovation: that everybody has a slice of genius. Thus, the leader’s job, they told us, was to unleash people’s talents and harness individual slices of genius to create astounding solutions via collective genius. Creative abrasion. This capacity for collaborative problem-solving includes the ability to generate a marketplace of ideas through discourse and debate. It requires a healthy culture of listening, inquiry and advocacy, alongside an underlying recognition that breakthrough ideas rarely emerge without diversity of thought and conflict. Creative agility. This capacity to learn by discovery includes experimenting through quick trial, reflection and adjustment. Typically associated with design thinking, this capability is a mix of the scientific method and the artistic process – in which you act, not plan, your way to the future. Creative resolution. This is the capacity to create new and better solutions by integrating diverse ideas, even opposable ones, in unanticipated ways. No one individual or group is allowed to dominate – neither bosses, nor experts. Rather, the team practices a patient and inclusive decision-making approach that allows “both-and” versus “either-or” solutions to emerge. Cultivating these capabilities requires a different mindset and talents than taking charge or setting direction. And focusing on capabilities alone is not enough. It’s tempting to believe that people are naturally eager to create something new and useful, when, in fact, they often are not. The diversity innovation thrives on, the conflict of ideas and options it requires, the patience it needs to test and learn from multiple approaches, and the courage it demands to hold options open until possibilities can be integrated in new and creative ways – all these things can make innovative problem-solving feel stressful, and even unnatural. No one can be commanded to innovate. Unless people freely open their minds and hearts, they are unlikely to contribute their best ideas or endure the sense of vulnerability that comes with innovating. Common purpose. People endure the personal challenges of innovation when they feel they are part of a group engaged in tackling something larger than anyone could accomplish alone. This sense of belonging enables individuals to withstand the inevitable conflict and tension that happens along the way. Shared values. Members of innovative organizations agree on what is important. Values influence individual and collective action; they shape a group’s priorities and choices. We found innovative organizations embraced four key values: bold ambition, collaboration, learning and responsibility. Mutual rules of engagement. Innovative groups follow two sets of ground rules for working together. Leaders attend carefully to how people in the group feel. To ensure people feel safe to contribute ideas, they cultivate mutual trust, respect and influence (words easier to say than practice). Leaders also pay heed to how people think. They ask everyone to question everything, be data-driven and take a holistic view. With all the natural human emotions associated with pursing innovation, the sense of community – a relentless focus on “who we are” and “why we are together” – was the essential ingredient that kept everyone aligned as they tackled what often seemed like intractable challenges or opportunities. This is a very quick summary of a profound and complex process. The bottom-line: if we want more organizations that can innovate routinely, we must unlearn some of our conventional notions about leadership. Understanding how leading innovation actually works is only the beginning of our journey. For over 30 years, my ambition has been to help people learn how to lead. Now, as I begin to understand how leading innovation is different, I am revisiting my assumptions. How do we identify high potentials for leading innovation? How do we develop them? Those seeking to identify and develop our next generation of leaders should consider this quote from one of our leaders who said, “I never tried to be the visionary, the expert, or the decisive ‘I’m in charge’ leader. Instead, I tried to keep conventional management to a minimum. My role was intended to be an ‘aggregator of viewpoints, not a dictator of decisions.’” Leading innovation is about setting the stage, more than performing. The leaders we studied saw their primary job as making the space for others to share their talents and passions. Thus, their colleagues described them as both the most demanding and the most generous individuals they had ever worked for. Rather than cultivating like-minded followers, these leaders sought to amplify diversity. Instead of avoiding conflict or missteps, they pressed individuals on their teams to engage in constructive debate and run experiments. They were constantly balancing paradoxes built into the innovation process, like encouraging learning so essential to innovation and the need for performance; knowing when to support half-baked ideas and when to be confrontational and force team members to confront reality. Perhaps most importantly, they recognized and relied on the genius of those around them. As one leader noted, “new ideas need friends”. He recognized that people were “baring a piece of their souls” and needed to “continually nourish each other”. Too often, I fear, individuals who do not exhibit take-charge, direction-setting behaviours may be perceived as “weak leaders”, and may be less likely to get access to social networks, stretch assignments, or fast-track educational courses that can develop their leadership talents. This is troubling to me, given what we now know about leading innovation. Other indicators – like the extent to which individuals don’t punish team members for the inevitable “failures” associated with taking risks, or an individual’s willingness to ask others for help – may actually be better markers of high potential leaders of innovation. One of the most gifted innovation leaders we studied was warned early in her career that if she “continued to lead from behind”, her prospects were limited. Fortunately, she followed her instincts and built one of the most innovative regions in her organization. My worry: we are overlooking those individuals who have the most potential to become master leaders of innovation. I would never suggest that simply finding the right people could solve our leadership deficit. Leaders are more made than born, despite what many like to believe. If we want to build the global talent pool for leading innovation, we must also ask ourselves: what are the opportunities people need to develop the mindset and skills required to lead innovation? One leader we studied decided to try an experiment. He let people who might otherwise be invisible in an organization make themselves visible. Instead of selecting high potentials to work with him on new business development, he allowed people to self-nominate to pursue opportunities that fit their passions. Many more than he anticipated volunteered to lead, recruiting others from across the globe to join them. The result: a number of promising business lines that met the needs of the poor and crucible leadership developmental opportunities for many. Current leaders must nurture the next generation of leaders, who need the space and opportunities to grow and lead with a more collaborative problem-solving approach. To begin, we must examine our own mindsets and practices. Do we believe that our job is to set direction and make sure no one deviates from it? Do we cling to the notion of a visionary leading from the front? Or are we comfortable serving as the “stage setter”, whose primary role is to create a context in which your team can innovate? Do we have the courage and patience required to amplify differences, even when the discussions become heated and when ambiguity and complexity loom? An alumnus recently challenged me at his 15th reunion: “You really expect us to become stage-setters now, when you taught us to be performers?” My reply was a resounding: “Yes, that is, if you want to lead innovation.” To build a sustainable future for our organizations and communities, it’s time we all rethink leadership and learn to create collective genius.